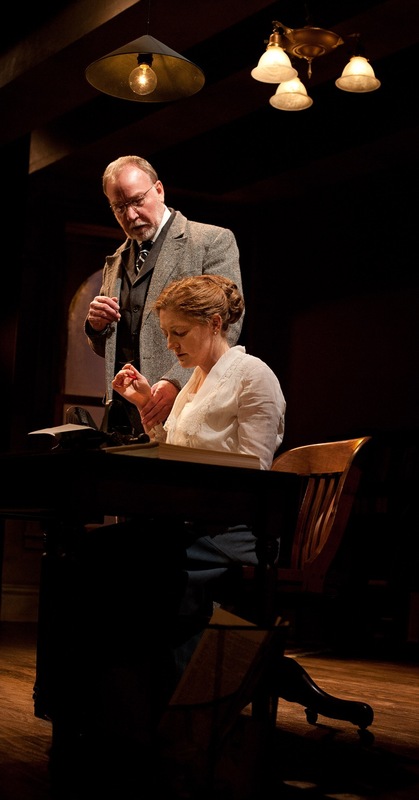 Dan Kremer and Rebecca Harris in The Ghost-Writer. We've all heard of the "ghost in the machine," that famous tag for one of philosophy's central conundrums, the mind-body problem. 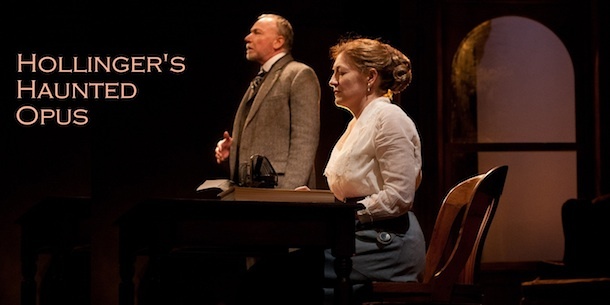 But now, in The Ghost-Writer (at the Merrimack Rep through May 13), playwright Michael Hollinger offers us the ghost in the type-writing machine: in this elegant three-hander, Hollinger conjures a late author who (perhaps) can still dictate from the great beyond, to the devoted secretary who has survived him, but has yet to complete his final novel - although she's working on it. Even if the jealous widow of her beloved is utterly determined that their illicit - spiritual collaboration, shall we say? - will never see the light of day. The trouble is that, at least for a time, director Charles Towers, and actors Dan Kremer and Rebecca Harris, have taken Hollinger's precisely clipped words a little too much at their word, attending obsessively to the elocution of the text, while only nodding in the general direction of the emotions rising beneath it. Indeed, we only realize in retrospect that love has bloomed, and that Harris is now essentially Kremer's muse - or that at least she imagines she is. Still, once love is indeed in the spectral air, there are several delicious shivers to be had in the play's final scenes - thanks largely to the perfectly pitched performance of Maureen Garrett as that not-so-grieving widow, who was always pleased to imagine that she was her famous husband's muse. And Hollinger does manage to tease a few amusingly ambiguous vibrations from the plight of his lonely amanuensis, her pale fingers poised over her dark keyboard as if it were a Ouija board, while one ear remains cocked to the spiritual plane. Is she indeed (as she believes) taking dictation from the dead? Or is she only indulging a delusion designed to stave off the painful reality of her passion's passing? Or - or - has her long collaboration with her virtual lover endowed her own imagination with something like his voice? Even if these mild mind games fail to intrigue you - and even if you find Hollinger's meditations on artistic collaboration (he also wrote Opus, the popular tale of a struggling string quartet) fall flat - it's still hard not to be moved by the spooky stylishness of this production. Leaving it, you may discover a certain chill has filled your heart as you gaze at the setting sun . . . and is that just the wind in the chimney, or the echo of a howl from the great beyond? Is that only the scratch of a tree-branch at your windowpane? Or is it a dead voice whispering its lonely secrets in your ear . . ? Again, to be pedantic, the whole "mind-body problem" really is only "central" in that it's taught in every intro to philosophy survey class. It's exclusively a fallout of Cartesian philosophy, and maybe Manichaenism if you want to interpret things religiously. It's just that historically speaking, it's really only those philosophers who accepted Descartes' whole line of reasoning (that including viewing the observable world as pure mechanism) who even arrived at this conundrum. It's a philosophical dead-end that no one worth listening to has taken seriously for centuries. Well, maybe you're right, but certainly cognitive scientists continue to argue about the nature of consciousness, so I wouldn't say Cartesian dualism is quite dead yet . . .
Well, that's due to the schisms between the disciplines. The scientists are often philosophically naïve just as those in the humanities are scientifically naïve. They simply have the most ridiculously superficial understandings of each other's fields. Well, I'm sure that's true but . . . I guess I'M still puzzled by the "problem" of consciousness too! did you really want them to make the underlying emotions overt? that was the mastery of the work... hidden beneath "obsession" and arguement, first over a period... a single dot, the smallest of possible characters or punctuations to disagree about. it was, to my mind, a master stroke (ooo, one more singular keyboard execution), that this master writer made us realize emotions were burning in retrospect! one of the best works i've seen in my 60 years. I don't need it to be "overt," but if the relationship is submerged too far, there's no dramatic tension for a good half hour. What is there should be ambiguous, but it shouldn't be missing.